often with washes of blue and purple. The combination of decreasing hours of daylight, the increasing length of darkness, and cool nighttime temperatures is nature’s signal that it’s time to prepare for winter. Plants gradually stop producing chlorophyll, which is responsible for the green color visible in the leaves during the growing season. The absence of chlorophyll reveals the colors of other chemical compounds present, like the yellows of xanthophylls, oranges of carotenes, and browns of tannins. Many days this fall have been warm and sunny. Nights have been cool with temperatures often in the low to mid 40s (4 – 8°C). These conditions enable deciduous trees and shrubs to continue to produce sugars in their leaves during the day. Some of the sugars combine with minerals obtained from the soil to manufacture anthocyanins, the chemicals that cause the red, blue and purple colors in the leaves. The decreasing number of daylight hours combined with the cool temperatures signal the plant to stop nutrients from moving into the trees’ circulatory system as the leaves prepare to detach from the plant. 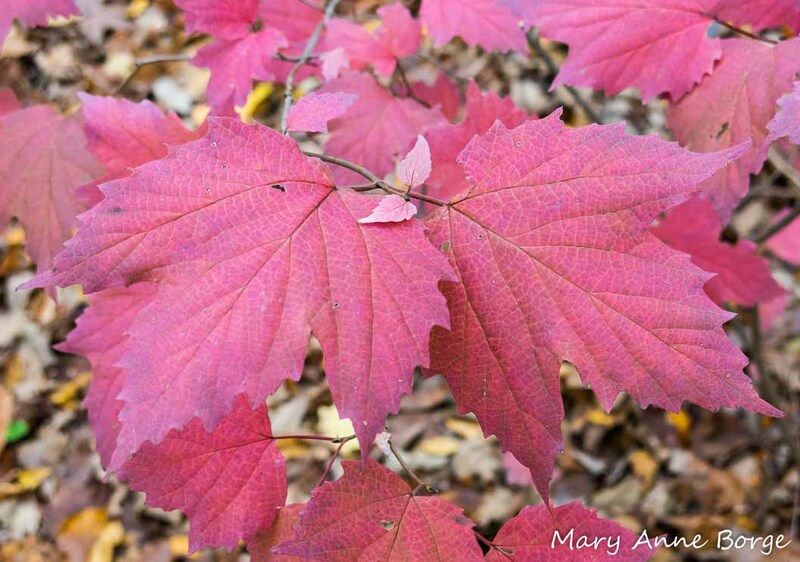 These chemical compounds are trapped in the leaves, resulting in the colorful fall display. and Hermit Thrush, as well as chipmunks and squirrels are among those who consume the fruits and disperse the seeds. 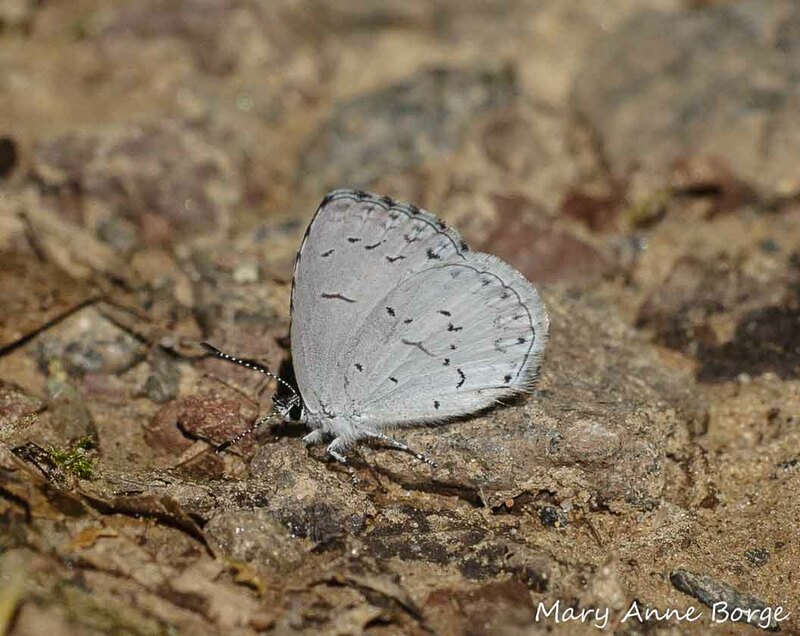 Spring or Summer Azure butterflies may lay eggs on the flower buds of this and many species of viburnums, dogwoods and other shrubs. After hatching from the eggs, the butterfly’s caterpillars feed on the flower buds. That is, they do if they manage to avoid being eaten by a predator like a bird, a spider, or another insect. Maple-leaf Viburnum (Vibernum acerifolium) in bud. Can you spot the two spiders waiting patiently for an unsuspecting caterpillar or other victim? Plenty of flowers survive the feeding frenzy to provide a beautiful summer display. Several species of native bees, flies and other insects visit the flowers for nectar, providing essential pollination services that result in the fall fruits. Maple-leaf Viburnum (Vibernum acerifolium) in flower. Look for the ants who are visiting the flowers for nectar. They would also be happy to find a caterpillar. 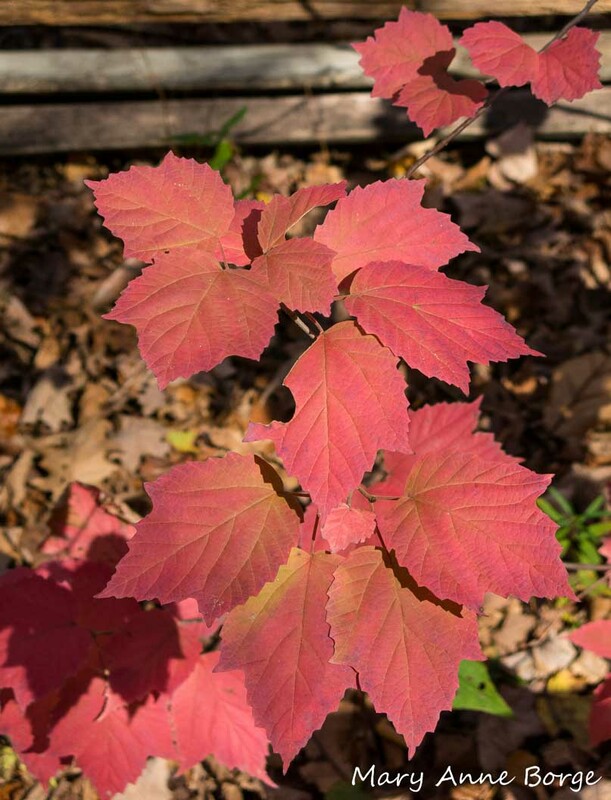 Maple-leaf Viburnum is a great alternative to the non-native, invasive Burning Bush (Euonymus alatus), which is often planted in formal landscapes for its fall foliage. Maple-leaf Viburnum offers an equally attractive, and more nuanced display. More importantly, it provides food and shelter for the insects, birds and other animals that share its territory. 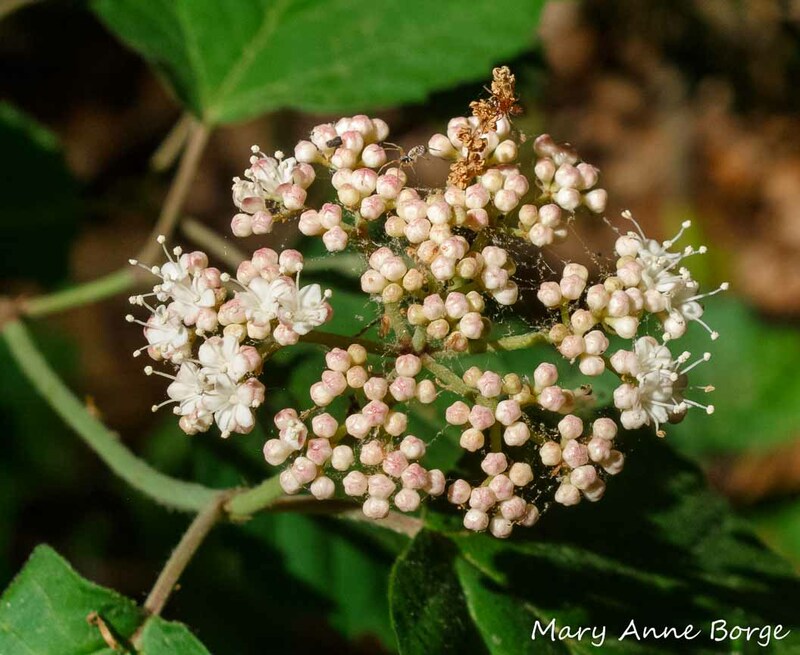 Maple-leaf Viburnum is a woodland understory shrub native to the eastern United States, and Quebec and Ontario provinces. 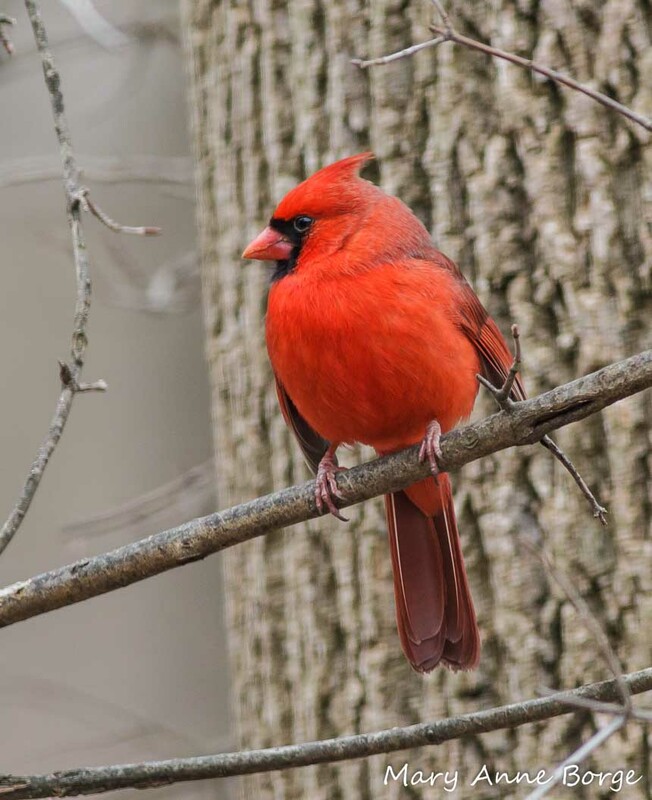 If you live within its natural range, go for a walk in the woods near you to see if you can spot it. Then think about adding it to your own landscape to guarantee a view of this gorgeous shrub. For more information on fall foliage colors, see Nutritious Fall Foliage: What Makes Fall Leaves So Colorful? Cech, Rick; Tudor, Guy. Butterflies of the East Coast. 2005. Glassberg, Jeffrey. Butterflies through Binoculars A Field Guide to Butterflies in the Boston-New York-Washington Region. 1993. 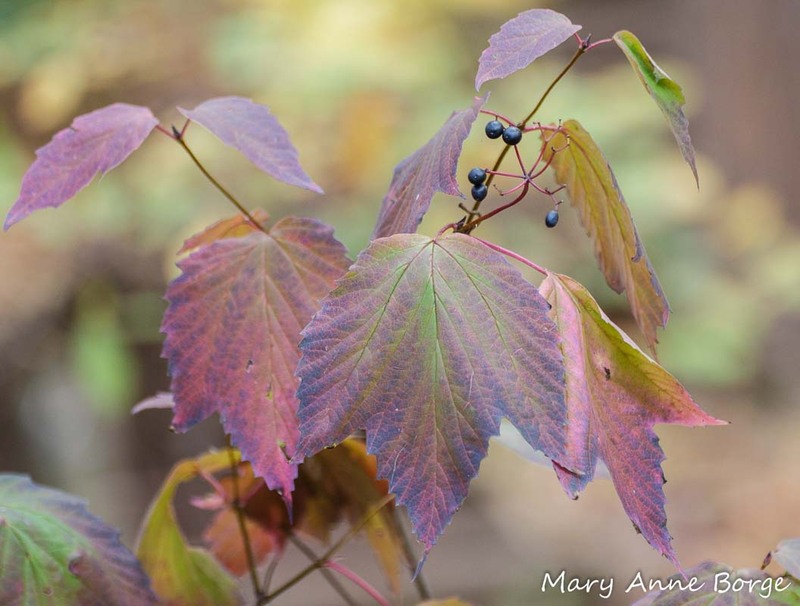 This entry was posted in Birds, Butterflies, Gardening for Wildlife, Native Plants, Other Animals, Other Insects and Spiders and tagged Fall Foliage, Maple-leaf Viburnum, nature, Spring Azure, Summer Azure, Vibernum acerifolium, Viburnum acerifolium by Mary Anne Borge. Bookmark the permalink. It’s such a wonderful shrub! A great choice for planting. Excellent post, thanks! Love the viburnums! Thanks, Deedee! I love the Viburnums, too. 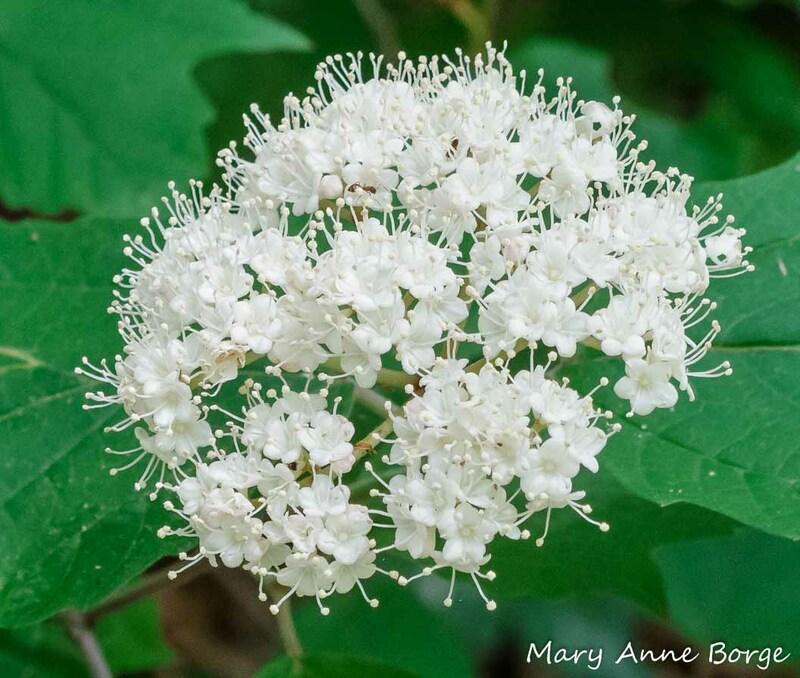 Arrowwood, Blackhaw, Possumhaw, Cranberrybush, Nannyberry, they’re all great plants. 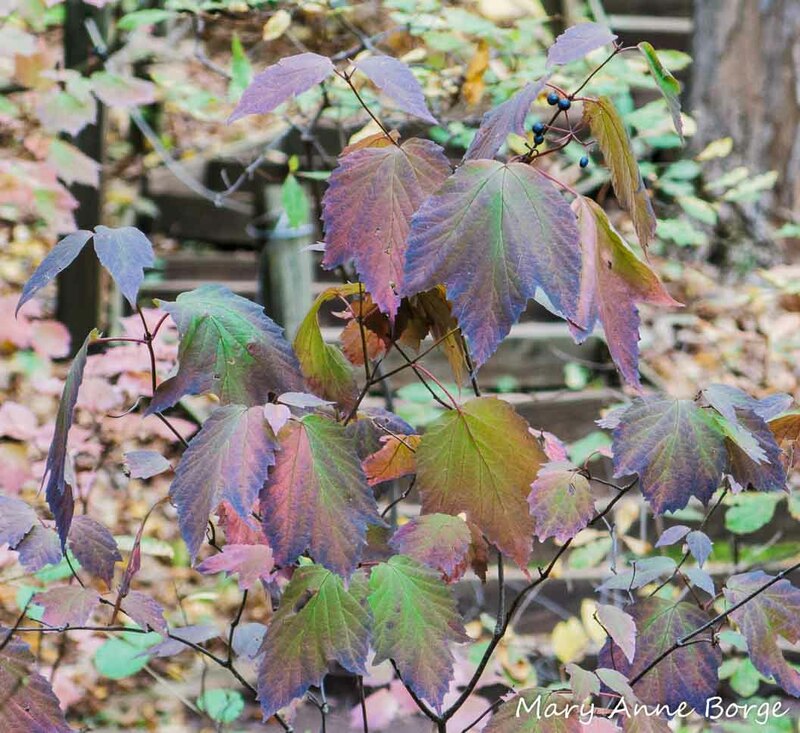 Burning Bush can be very pretty during fall foliage season, but so can many native alternatives. 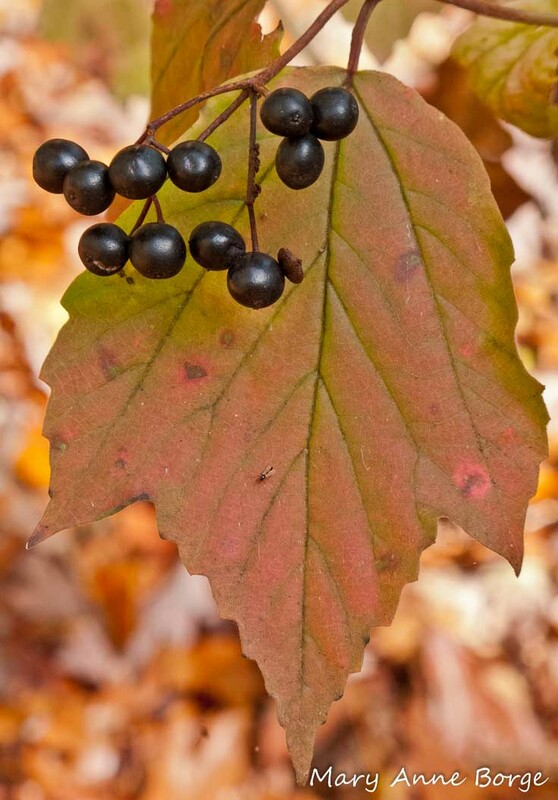 Arrowwood Viburnum also shows great fall color, and Winterberry Holly has fabulous fruits. These native shrubs provide food for a myriad of insects, both pollinators and foliage feeders. Which means more pollinators for other plants, and food for birds and other animals higher up in the food web. Using Burning Bush takes away valuable real estate for these essential native plants and the animals that depend on them. 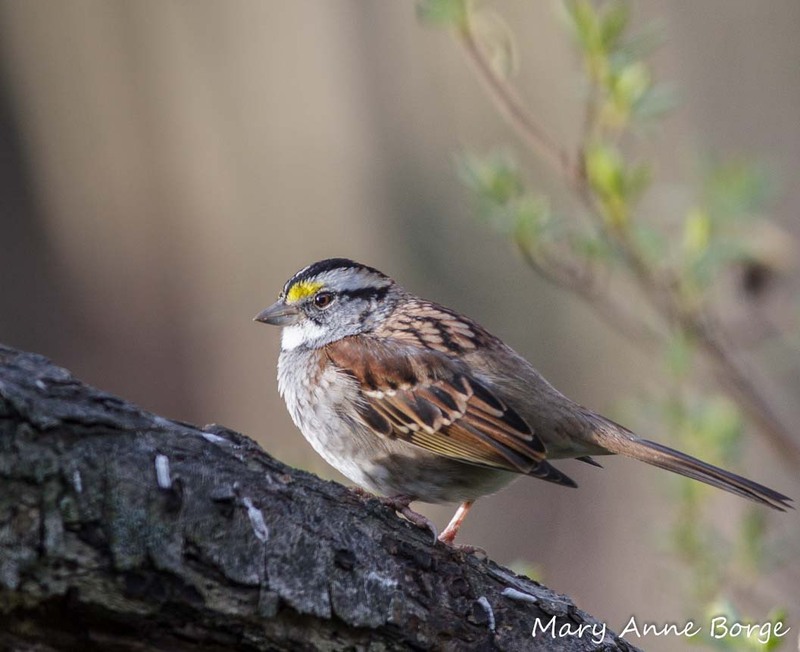 Replacing it with a native alternative can provide wildlife habitat even in a formal landscape. I know you’ll pass the message on! Excellent! I live in a townhouse development, and yet was able to get permission to install a bed of native plants on the common ground next to us, so that gives me hope. Thanks for the excellent post. I, too, was impressed by how noticeable they seem to be this year and have also been compelled to comment. Thanks! I couldn’t resist featuring them, they’re so beautiful! I, too, love this viburnum, but you forgot to mention the soft velvety texture of the leaves. Your blogs are always a pleasant “armchair walk” in the woods and fields. You’re right, Pat! The leaves of Maple-leaf Viburnum are wonderfully soft and velvety due to very short hairs covering the leaves. This is an adaptation of some plants to discourage herbivores from eating the leaves. Thank you!